The Titanic sank on Monday April 15th 1912. 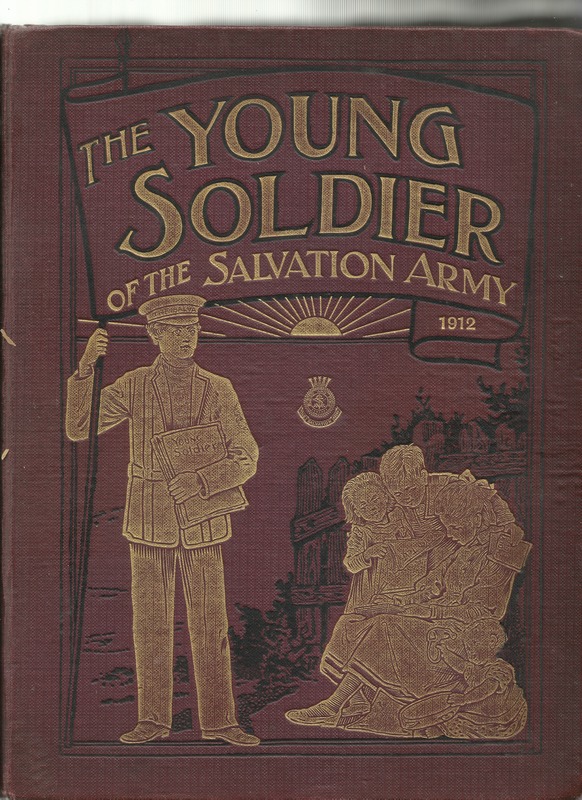 Two days later this article was written for The Young Soldier of The Salvation Army. Even now, though I write on the morning of April 17th, the world does not know just how it happened. 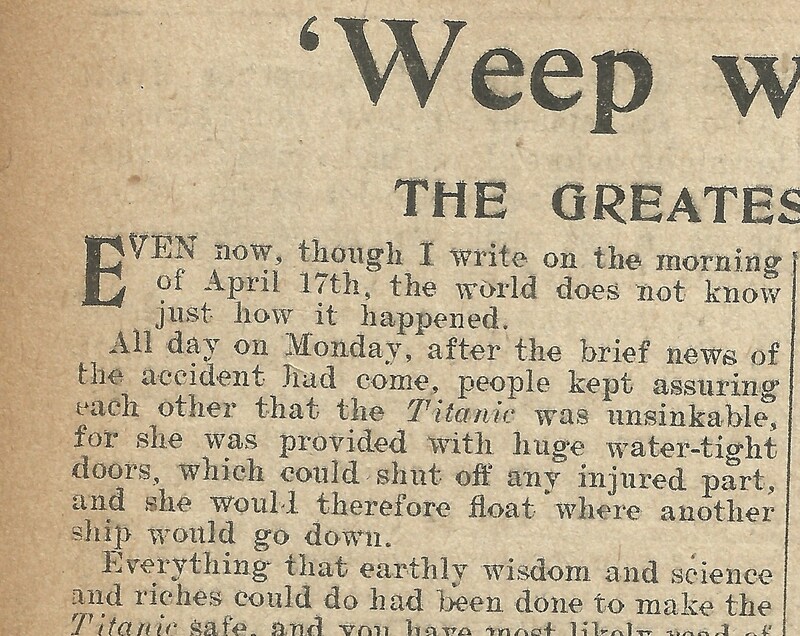 All day on Monday, after the brief news of the accident had come, people kept assuring each other that the Titanic was unsinkable, for she was provided with huge water-tight doors, which could shut off any injured part, and she would therefore float where another ship would go down. 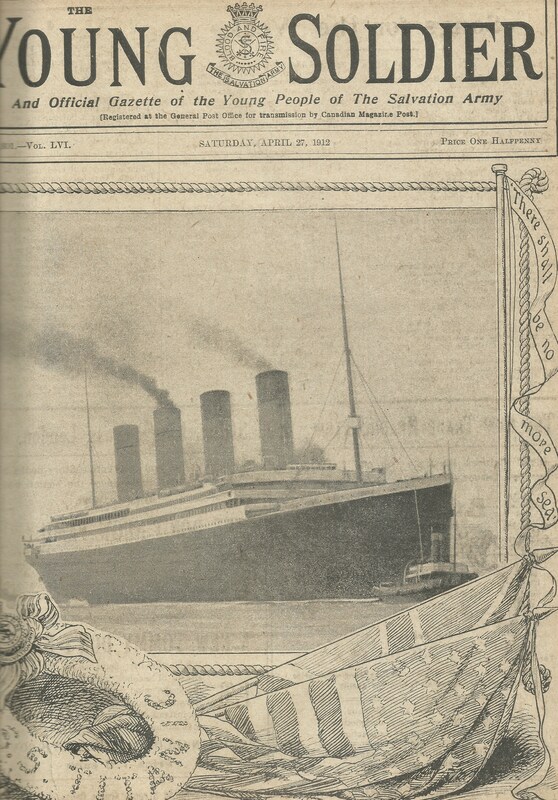 Everything that earthly wisdom and science and riches could do had been done to make the Titanic safe, and you would most likely read of all the wonders which she contained – the swimming bath and the racquet-court, and the dining-hall, in which over 500 people could dine at once at small, separate tables. There were suites of rooms on board like little flats, exquisitely furnished, and each with its own front door; indeed, no such ship had ever been launched before. Then, on Monday night, came reassuring messages to say that all the precious lives were saved, and that the Titanic herself was being towed into Halifax. But on Tuesday we learnt the awful truth; how that at midnight on Sunday the Titanic struck an immense iceberg and sank three hours afterwards. We learnt, too, that 1,653 people went down with her. This was the Titanic’s first voyage. She had one of the finest captains in the service – experienced and able – and she had been but three days at sea when, in the darkness of the night, she struck one of those terrible moving masses of ice, which in spring and autumn make the northern routes across the Atlantic so dangerous. Other ships, less large and less costly, have struck icebergs; but they have managed, damaged though they were, to reach port. As soon as the accident happened, Mr. Phillips, the wireless operator, sent his messages from the little room on the highest part of the ship: ‘Struck iceberg, badly damaged, help urgently needed.’ These messages were received by liners at great distances, and at once they turned their course, put on all speed, and hastened to the rescue. But at 12.27 American time, or 2.20 English time, the last message came saying that the ship was sinking by the head, and that the women and children were being taken off in the life-boats. Then some blurred, indistinct words came through, and then perfect silence. Boat-loads of people were taken on board the Carpathia, but the other liners, when at last they reached the place, found only bits of wreckage floating on the sea. Now, there is one thing which I want you all to notice very carefully, and which in the midst of all the terrible sorrow and shock, is very beautiful. All captains and commanders of ships know that the law of the sea is that in times of danger the women and children first are to leave the sinking ship and to be placed in the life-boats. Now, this is exactly against nature, for the strong men, those who can fight and push, would of themselves quickly fill the boats, leaving the weaker to go down with the ship. But no, if we had been on the Titanic, we should most likely have seen Captain Smith standing by the gangway with his revolver in his hand ready to shoot down the first man who tried to push through and take the place of the women and children. And this is why in the list of the saved you find little children and their mothers – many from the third class as well as from the first – while most of the men, some who were millionaires and who had great power and influence on shore, are missing. 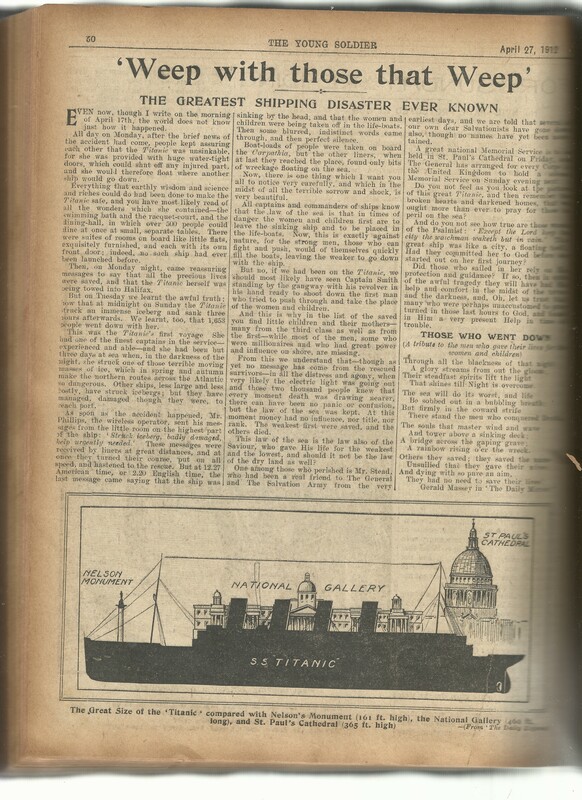 From this we understand that – though as yet no message has come from the rescued survivors – in all the distress and agony, when very likely the electric light was going out and those two thousand people knew that every moment death was drawing nearer, there can have been no panic or confusion, but the law of the sea was kept. At this moment money had no influence, nor title, nor rank. The weakest first were saved, and the others died. The law of the sea is the law also of the Saviour, who gave His life for the weakest and the lowest, and should it not be the law of the dry land as well? One among those who perished is Mr. Stead, who had been a real friend to The General and The Salvation Army from the very earliest days, and we are told that several of our own dear Salvationists have gone down also, though no names have yet been ascertained. A great national Memorial Service is to be held in St. Paul’s Cathedral on Friday, and The General has arranged for every Corps in the United Kingdom to hold a solemn Memorial Service on Sunday evening next. Do you not feel as you look at the picture of this great Titanic, and them remember the broken hearts and darkened homes, that we ought more than ever to pray for those in peril on the sea? An do you not see how true are those words of the Psalmist: ‘Except the Lord keep the city the watchman waketh but in vain.’ This great ship was like a city, a floating town. Had they committed her to God before she started out on her first journey? Did those who sailed in her rely on His protection and guidance? If so, then in spite of the awful tragedy they will have had His help and comfort in the midst of the terror and the darkness, and , Oh, let us trust that many who were perhaps unaccustomed to pray turned in those last hours to God, and found in Him a very present Help in time of trouble. That shines till Night is overcome. There stand the men who conquered Death. A rainbow rising o’er the wreck. They had no need to save their lives. This entry was posted in Churches, The Salvation Army and tagged Sinking of The Titanic, The Salvation Army, The Young Soldier, Titanic. Bookmark the permalink.